We can seal up your professional look with custom envelopes. Stop placing return labels on your envelopes and allow us to print the professional looking business envelopes for you. Pick from a variety of envelope stock colors, finishes, and sizes. We will print either black ink or color ink. 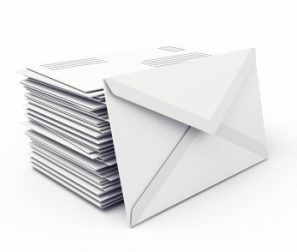 Additionally, we can print the addresses right on the envelope and save you the time and hassle of hand-writing the names and addresses on each envelope. Use our envelope printing service for business envelopes, thank you cards, holiday greeting cards, wedding invitations, etc. etc.